For cows to digest the starch in corn efficiently, the corn kernels in chopped and processed whole-plant corn must be broken into small particles. Three decades ago it was thought that effective starch utilization occurred if the corn kernel was merely nicked or broken. With today’s high-producing animals, we know kernels must be processed into smaller particles for dairy cattle to get adequate starch utilization given the short duration feed resides in the rumen. During harvest, how can I tell if my kernel processor has sufficiently processed the kernel fraction? The right time to determine the adequacy of kernel processing is at the time of harvest when harvester adjustments can be made to correct inadequate processing. However, it can be difficult to see how well the kernels are processed when they are mixed with the stover fraction of the plant. A water separation technique has been developed that can be used in the field or at the silo to separate the stover and kernel fractions (Savoie et al., 2004). This simple technique exploits differences in buoyancy between the kernels and stover. Simply put, when placed into a water bath, the stover floats and the kernels sink. Step 1: A suitable container is required to hold water and the crop. A conventional dishpan works very well or a 5-gal. pail can be used. Fill the dishpan about ¾ full of water or the 5-gal. pail about ½ full (fig 1). Step 2: Collect two to three representative handfuls of processed crop and place it in the water. Step 3: Gently agitate the material to help separate the kernels from the stover mat (fig. 2). Less than a minute of agitation is required. Step 4: Skim the floating stover from the water. This can be done by hand (fig. 3) or by using a strainer – an ice fishing strainer for instance. Step 5: The water will be quite murky and the kernels difficult to see, but they will be at the bottom of the container. To see the kernels, carefully drain the water from the container (fig. 4). Although not necessary, water can be drained through a sieve made of window screen so floating kernels are captured. Step 6: The kernels can be poured onto a cloth or heavy-duty paper towel and water squeezed from the kernels. The kernels can then be spread out for inspection and evaluation of the degree of processing. When the crop is very green, dark green leaves will sink with the kernels. These leaves can be separated by hand after step 5 above. An alternative is to partially dry the sample prior to separating. This can be done several ways. A minute or two in a microwave oven typically dries the material sufficiently to insure good separation of the green leaves. Material can be spread on a black plastic sheet and placed in the sun for an hour or so to dry it sufficiently to help separate the green leaves. Ensiled material, especially if ensiled at high- moisture, will not separate well. Thoroughly drying the sample in an oven promotes better separation. If after draining the water from the container (Step 5 above) there is too much stover with the kernels, add some water back to the container, swirl the contents and quickly drain off the water. This second iteration helps remove the remaining stover. How do I assess whether the degree of processing is sufficient? After separation, the assessment of the degree of kernel processing is subjective. 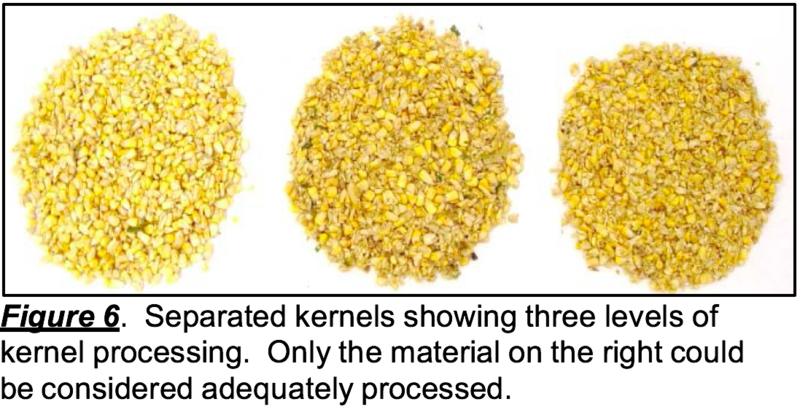 The presence of many whole-kernels is a clear indication processing level is insufficient. If there are almost no whole kernels, but many are simply nicked, cracked or broken, then processing level may be considered barely adequate. Properly processed materials should have almost no whole- or cracked-kernels. Figure 6 shows three levels of processing, with the material on the right considered adequate. What should I do if kernel processing is not sufficient? The level of kernel processing is affected by both the cutter head theoretical-length-of-cut (TLC) and the kernel processor roll clearance. The TLC should be set to provide the effective fiber required by your cattle, so processor roll clearance should be the adjustment of choice for changing the level of kernel processing. The roll clearance should be 2 to 3 mm (0.08 to 0.12 inches). This is the thickness of a typical pocket knife blade or the thickness of a dime or nickel. Very small clearances over processes the material, reduces harvester productivity and consumes more fuel. How do I know if my judgement of particle size is sufficiently accurate? 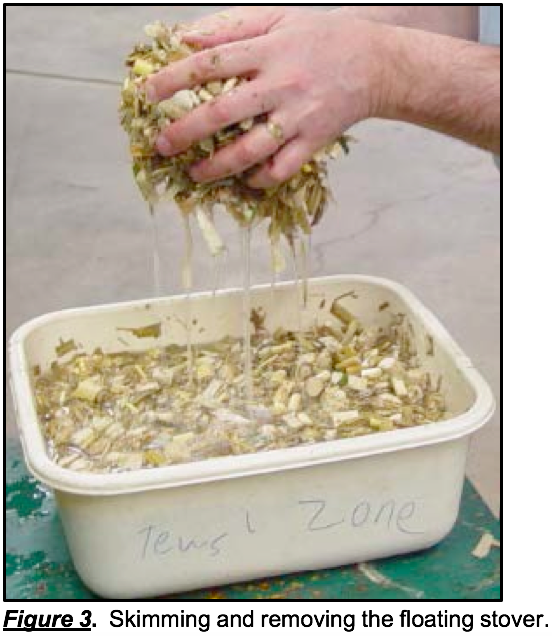 A forage analysis laboratory can conduct a Corn Silage Processing Score (CSPS) test to provide a more analytical assessment of kernel processing (Mertens, 2005). The CSPS defines starch particle size and can be used to predict ruminal and total tract digestibility of starch. The CSPS analyzes starch particle size by sieving the material in a Ro-Tap Shaker. Material passing a 4.75 mm screen is analyzed for starch content. 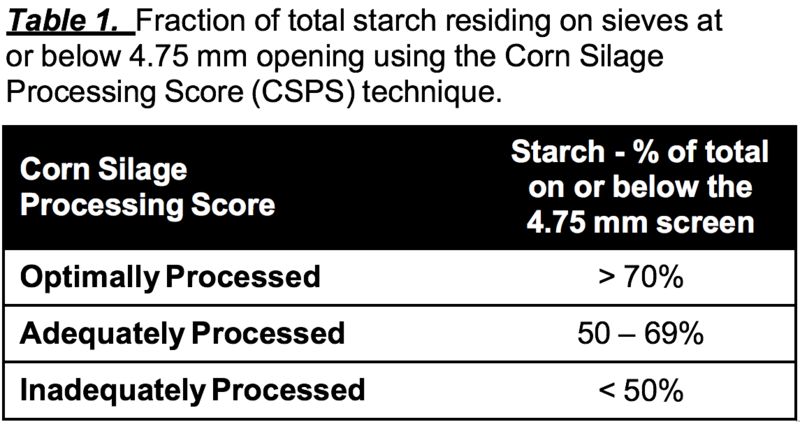 The percentage of total starch passing through this screen establishes the “Processing Score” (table 1). The CSPS is a good analytical tool for assessing the expected performance of the corn silage placed into the silo. Unfortunately, because of the delay in conducting the analysis, it has limited value for making “real-time” decisions about how to properly set up the forage harvester as the material is harvested. The water separation technique described here is a simple and fast method of assessing the level of kernel processing as harvest progresses. 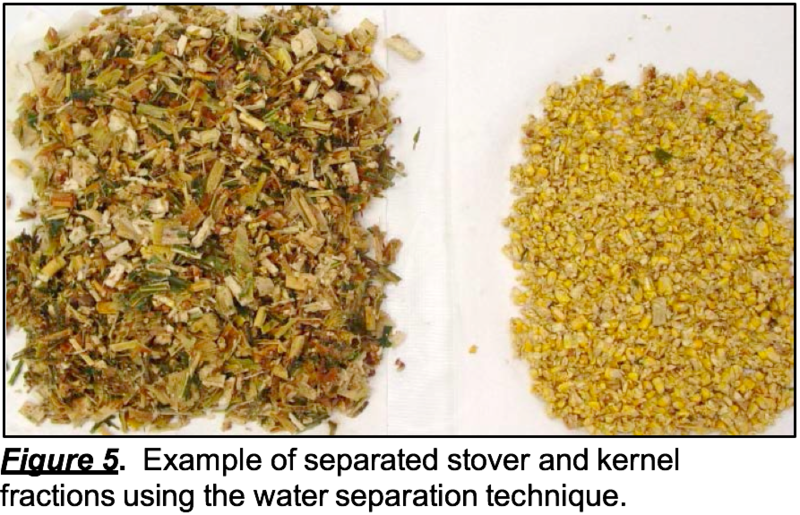 Can the water separation method be used to assess level of kernel processing for silage being removed from a silo? The water separation method is effective on silage, but ensiled material, especially if ensiled at high-moisture, does not separate well. Thoroughly drying the sample in an oven promotes better separation. However, it is better to assess kernel processing level at harvest when there is an opportunity to make harvester adjustments to provide the desired level of processing. There are limited options for improving the level of kernel processing at feeding. If the CSPS indicates inadequate processing, plan to use the water separation technique explained above to assure the processing rolls on the forage harvester are properly adjusted during the next harvest season. Mertens, D.R. 2005. 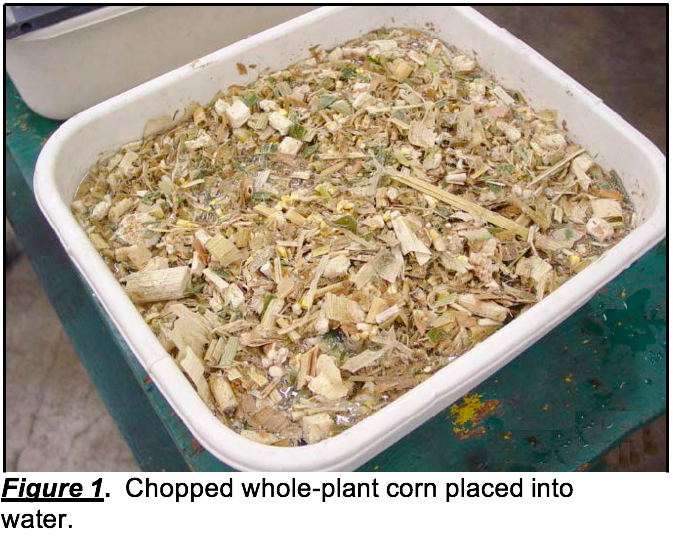 Particle size, fragmentation index, and effective fiber: Tools for evaluating the physical attributes of corn silages. 4-State Dairy Nutrition and Management Conference, Dubuque, IA. Midwest Plan Service, Iowa State, Univ., Ames. Pages 211-220. Savoie, P., K.J. Shinners and B.N. Binversie. 2004. 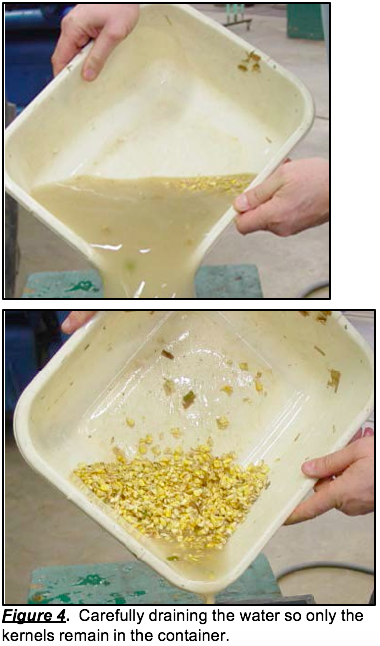 Hydrodynamic separation of grain and stover components in corn silage. Applied Biochemistry and Biotechnology Vol. 113:41-54.